When Di Morgan opens her Marlbrook garden for the National Gardens Scheme in August she will be following in the footsteps of her father and grandfather as a third-generation Worcestershire gardener. 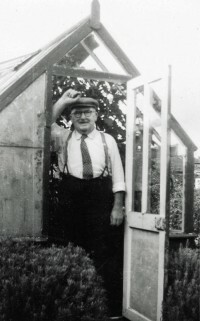 Di’s grandfather, William Collis, took on the role of Head Gardener at Westwood Park near Droitwich in 1914. Apart from a spell fighting in WWI, he worked there for the rest of his life until the last Lord Doverdale, who owned the property, died without an heir in the early 1950s and it was broken up into apartments. It was William who designed and created a topiary garden that has been a feature of the grounds for over half a century, as well as managing many aspects of the estate. Di’s father, Jack Collis, started his horticultural career working for his father at Westwood. After it was sold in the 1950s, Jack moved to new employment in Plymouth Road in Barnt Green and later into the centre of the village where he became a well-known character and a distinguished all-rounder at Barnt Green Cricket Club. Di picked up much of her gardening knowledge from her father and grandfather but didn’t really start to create a garden worthy of being accepted into the NGS until the early 2000s. In 2005 it was assessed, and subsequently accepted as part of a group of gardens. Now, some 11 years later, it is a well-established cottage-style garden packed full of shrubs and herbaceous plants with ponds, water features, artefacts and sculptures, and has been featured in various magazines over the years. Although William and Jack, so used to gardening on a grand scale, would probably be a little surprised by the sheer volume of plants in a relatively small space, they would no doubt be pleased that Di has carried on the family tradition. 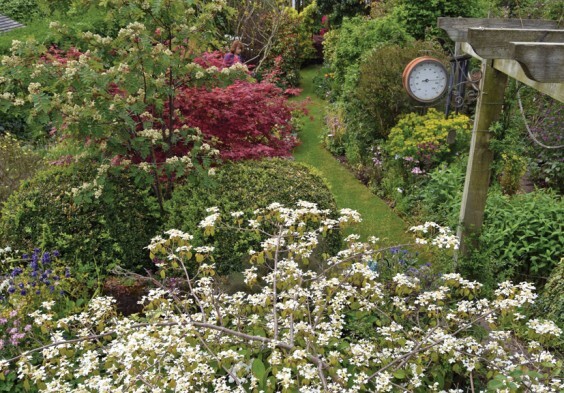 Di’s husband Dave, who became the Worcestershire County Organiser for the NGS three years ago, admits that Di is the real gardener while he is more of an “apprentice” – in fact he calls her the Head Gardener, perhaps reflecting her horticultural heritage. Di and Dave’s garden (above), at 504 Birmingham Road, opens with Round Hill Garden in Braces Lane as “Marl-brook Gardens” on Sunday August 21 from 1.30 until 5.30pm. The entry fee of £5 goes to the NGS, which raises money for charities like Macmillan, Marie Curie, Parkinson’s and the MS Society. In addition, money raised through the sale of refreshments goes to the Basement Project in Bromsgrove, which supports local homeless young people. For more details of the NGS visit www.ngs.org.uk or pick up a Worcestershire leaflet from most garden centres and libraries.